It makes sense that Jackman’s final outing as Wolverine, seventeen years into the gig, should want to emulate Eastwood’s finest, given the question of where do superheroes go to die? is a beautifully enticing one. As with gunfighters of the old west, how does a man find peace in his final days after a lifetime of bloodshed and violence? And for its faults, Logan is a movie that doesn’t shy away from the notion of bloodshed. This is as brutal as anything comic book we’ve ever seen on screen before. And all the stronger for it, given that this is a story about responsibilities and the consequences of actions. 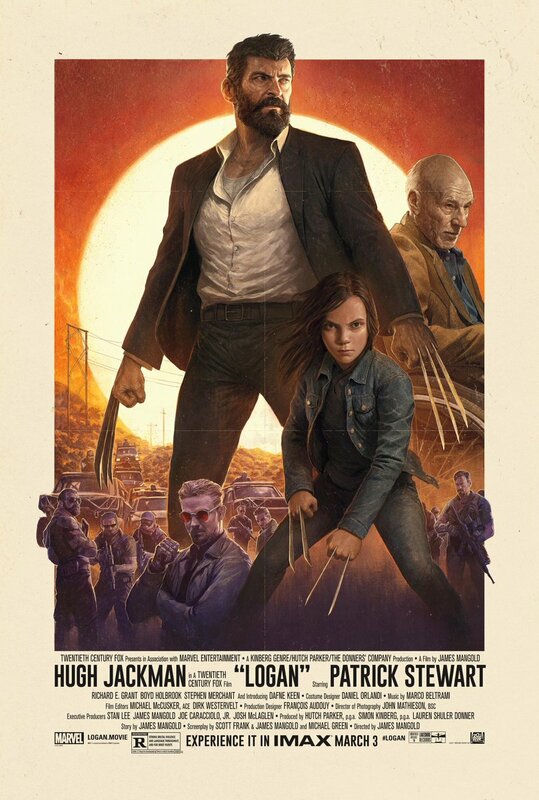 Technically, we’re in the relatively near future, but we may as well be in the dying days of the old west, as a world and life-weary Logan slowly finds himself poisoned by the adamantium in his system, but still trying to protect an ailing Charles Xavier, the greatest mind in the world now riddled with dementia and pills trying to control both. Mutants are almost the stuff of comic book mythology until a young girl appears and says “Shane, come back…” She doesn’t actually say that, but she may as well. Mangold’s movie is a very noteworthy attempt to let the superhero movie grow up and to find it a place in the overall lexicon of American cinema. And a great deal of it succeeds in doing both those things. Jackman has never been better, not just in this role, but in his entire career. Stewart too plays Prof X as a grace note, finding real strength in his lack of same. Mangold’s visual sense is better than he’s previously displayed, using his landscapes to help define his people within them. The film takes a few too many detours however, notably a Wolverine on Wolverine subplot that takes away more than it adds.